Market Research Reports, Inc. has announced the addition of “Wind Energy Market in India 2014 - 2022" research report to their website http://www.MarketResearchReports.com. Wind Energy Market in India is expected to reach US$ 31.25 billion by 2022. India has set a target of achieving overall wind energy installed capacity of 27,300 MW by 2017 and 38,500 MW by 2022. As per NOVONOUS estimates, this creates an US$ 31.25 billion opportunity in the wind energy market in India till 2022. The wind energy market in India has been growing since the last many years. The total installed capacity of the Indian Wind Energy market is 21136.20 MW. India stands at the 5th Rank in terms of the total installed wind power capacity just behind China, USA, Germany and Spain. But the potential is far from being utilized. It is estimated by the Indian Wind Energy Association that the Wind power potential for all the states of India put together would be in the order of 1.5 GW. It can sustain the growing needs of electricity of the Indian consumers in a sustainable way. For more information about this report, please visit: Wind Energy Market in India. The report aims at providing the reader a detailed view of the industry with the use of analysis frameworks which help in identifying the political, economical, social and technical factors that determine the scenario of the market and the market forces prevailing in the industry. The Key challenges faced by existing players and the barriers for a new player entering into the market, are also covered. The report also identifies the role played by the central and the state governments by analyzing the incentives and subsidies offered by central and state governments. This report also provides details about risks associated with credit, policy and technical factors in Indian wind energy market. The report also has detailed company profiles including their position in wind energy value chain, financial performance analysis, product and service wise business strategy, SWOT analysis and key customer details for ten companies namely Suzlon Energy Limited, Gamesa Wind Turbines Private Limited, Vestas Wind Technology India Private Limited, Wind World India Limited, Global Wind Power Limited, Inox Wind Limited, Kenersys India Private Limited, Regen Powertech Private Limited, NEPC India Limited and LM Wind Power Technologies (India) Pvt. Ltd.
11.2.1 LM Wind Power Technologies (India) Pvt. Ltd. This report is available at US$ 1995 for Single User License, US$ 2995 for Site User License and US$ 3995 for Global User License. 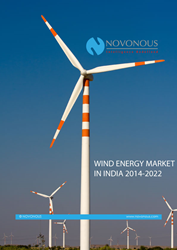 For more information and purchase this report, please visit: http://www.marketresearchreports.com/novonous/wind-energy-market-india-2014-2022. To browse more market research reports by NOVONOUS, visit: http://www.marketresearchreports.com/publisher/novonous. NOVONOUS helps organizations differentiate themselves, break entry barriers, track investments, develop strategies and see through corporate fog by providing business intelligence that works for their business. For more information about NOVONOUS, visit: http://www.novonous.com.